I would imagine by now most people are aware of my aversion to using ethnic groups as sports mascots and how deeply bewildered I am by the fact that my home town’s football team happens to be the Redskins. I’m not even going to entertain the idea that the name isn’t racist– the very fact there is a debate over if ‘it is or isn’t’ shows the invisibility and disenfranchisement of Native peoples in the United States. This nickname for Ajax fans dates back to before World War II, when Amsterdam was home to most of the Netherlands’ 140,000 Jews and the Ajax stadium itself was located near a Jewish neighbourhood. Most Dutch Jews were killed by the Nazis during the occupation, and today very little remains of Amsterdam’s old Jewish quarter. But the tradition at Ajax survived. The truth of this account is still up for debate. Sociological Images has an interesting dissection of the appropriation of Israeli political symbols by Ajax fans and this NYT article spotlights some of the more sinister anti-Semitic antics of both rivals and fans. This includes Nazi salutes, people shouting “Hamas! Hamas!” and hissing to imitate the sound of gas entering a death chamber. Let me be the first to say: Keep it classy, European futball fans. The outsider status fans feel by labeling themselves Jews has become a badge of honor, they think of themselves as being part of a distinctly oppressed subculture and gain a sense of group cohesion from that. The only problem is that they aren’t actually members of this oppressed ethnic group and appropriating the symbols and rhetoric of that struggle for the sake of sport is totally . Despite Ajax’s best efforts to nip this thing in the bud (spurned not by the rampant antisemitism, but by a chant calling a star player’s girlfriend a whore), decades of identification can’t be stopped–I mean, honestly, do you expect all those gentiles with the Star of David tattooed on their shoulder to just drop it? Here’s a clarification: This approach is different from economic populism. Why? Economic populism can be translated directly into policy. Whether you agree or disagree with the arguments, saying CEO’s make too much money or that oil companies don’t need tax cuts is policy-translatable. If you talk about the middle class in your home town in terms of putting pay caps in the bailout or changing the tax structure, you can campaign on those details. And it’s a fair debate as to whether they’re good policies. …Oh, yeah, it’s so obvious I’m a Washington outsider…. …we need a little bit of reality from Wasilla Main Street there, brought to Washington, DC…. …average, everyday American family like mine…. I don’t know if anyone remembers this, but watching the debate I just pictured the McCain strategists sitting around a table chanting “ONE OF US! ONE OF US!” as debate preparation. So in terms of “winners?” I think Palin held up quite well considering they’d lowered the standards to the point where, as a friend of mine said, “the only way she can ‘lose’ is to call for the extermination of the Jews.” That said, it wasn’t a game-changer. She still looked like a student who’d pulled an all-nighter prepping for comps. So, summary? Palin beat expectations, but nothing consequential happened. –David Gregory blathered that the Obamas are trying to make Americans comfortable with them. Because you know, we’re voting on dinner guests. Says Michelle has a “threshold test,” and that there are “questions about her.” I have questions about David Gregory, but no one asks me. -I love me some populist Jim Webb, but tonight he name-dropped our “Jacksonian base.” Really? We’re trailing among likely Indian-killers? -Scarborough was down on the floor concern trolling about Obama’s poll numbers when Olbermann countered with a different poll in which McCain has lost seven points among likely voters since last week. Olbermann then asked Scarborough if he could actually back up what he’s saying. It got awkward right quick. -(Former) GOP Rep. Jim Leach spoke as the token convert. Leach is a good man, even if Loebsack is better. In his losing campaign, the 30-year incumbent refused to take not only PAC money but any money raised outside of his district. He also insisted that the national GOP drop a mailer it had planned attacking his opponent on gay marriage. Leach was always a good egg and it was nice to see him somewhere he belongs. -Teddy Kennedy is a lion. And I’m not ashamed to say he makes me cry. Go re-watch this too. -Pelosi is a bad speaker but she got her headline quote in: “John McCain has the experience…of being wrong.” Also notes that she’s the first Italian-American Speaker of the House. We don’t really think of white ethnics as having barriers today, but it’s worth noting that her and a central-casting Irish Catholic were two of the stars of the night. -JIMMY! Comes out with a cameo to “Georgia On My Mind.” This is worth watching. -Gene Robinson says the press is overstating the disunity narrative. Norah O’Donnell discusses Bill’s “psychodrama,” and Pat Buchanan calls this a “deep wound” because HRC wasn’t vetted for VP. Rachel Maddow notes that the self-identified Democrat used in a McCain tv ad was interviewed and said she thought McCain was pro-choice. Buchanan counters that this “doesn’t matter,” to which Maddow calls Clinton dead-enders “post-rational.” I can’t wait for September 8. 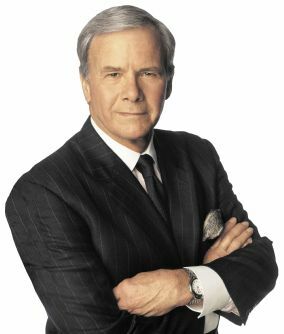 -Tom Brokaw and Sibelius look like brother and sister. -Michelle Obama’s brother is the head basketball coach at Oregon State. This led to the first and last time anyone shouts GO BEAVERS at a convention. GO BEAVERS! DENVER (AP) — Michelle Obama declared “I love this country” Monday as she sought to reassure the nation that she and her husband Barack share their bedrock values and belief in the American dream. In the first major address at the Democratic National Convention, Michelle Obama said she and Barack Obama feel an obligation to “fight for the world as it should be” to ensure a better future for their daughters and all children. The Obamas two daughters, Sasha and Malia, joined their mother on stage after the speech as Stevie Wonder’s “Isn’t She Lovely” blared from in the convention hall. You won’t get a better AP opener than: “Michelle Obama declared “I love this county…” Howard Fineman: “I think Michelle dug herself beautifully out of any hole she may have dug herself… it was classy, it was humble…” Fineman used the word “beautiful” four times in two sentences. These assholes matter, so yeah. Beautiful. -General truth, Democrats pwn music. Saturday, Obama came out to U2’s City of Blinding Lights. Biden followed to Springsteen’s The Rising. Carter of course had his usual Georgia on my Mind, while Michelle rocked Stevie Wonder’s Isn’t She Lovely? For comparison, John McCain tried to use Jackson Browne and got himself sued. me: Biden is like, I’d hit that. Not actually hit it, because I have a good record on violence against women. But hit it like, you know.